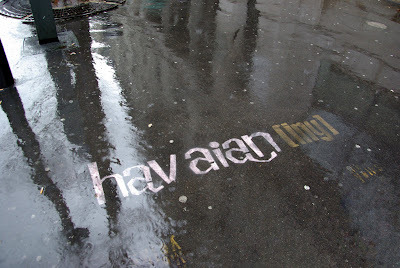 ParisDailyPhoto: A little sunshine in the rain? It's not exactly the perfect time to be in Paris at the moment... When I went out this morning it was pouring rain like crazy and it's a miracle I managed to take this photo without damaging my camera! According to my favorite Paris weather forecasts site there will be a 70% chance of rain almost every day next week. Should I give up my scooter?! Now about this sign, I first thought it was related to Havaianas, the famous Brazilian sandals brand, but in fact it seems to belong to some obscure French Federation of Havaianing that promotes doing sports in sandals?! It's either very stupid or very clever. iN MY STREAM OF CONsCIOUSNESS WORLD, i THOUGHT OF mONICA IMMEDIATELY! In my other world, I live where people pray for rain. I love Paris so much, even the rain doesn't stop me. You find lots of sidewalk writing!!! !I will need to keep my head up AND down when walking there. We're going to have rain in my part of Southern California all week here, too, Eric. At least it feels more like Christmas here when it's cold and rainy. Palm trees and sunny 80 degrees make it hard to get in the Christmas spirit! I am keeping my fingers crossed to get rain in Los Angeles. One drop of rain and we will be on "storm watch" (lol). I think the wet pavement 'makes' it, Eric ~ a lovely reflective photo. We're grateful for any rain we can score here, too, though it certainly doesn't make for scooting weather. Scootering? phx, I thought of Monica, too! Nadege is right (I'm in Pasadena). We're hoping for just enough to soak, but not enough to send mudslides down upon us. I know someone who runs barefoot. Seems crazy to me in an urban world, but she loves it. I can't help saying I first thought of Havaianas too, which I currently have on my feet! PHX if you still have the ones I gave you, you can see the resemblence. I went to the website, and it seems even more specific than just sandals—i.e., flip-flops (which I'm wearing right now, so I'm in!). We're enjoying (or tolerating) the same weather, Eric. Get a huge parapluie if you must, but please don't let the weather keep you from taking photos! I love the light in this photo. Also a very nice current Paris moment. Following up from yesterday - I just looked up 'chateau d'eau' in French Wikipedia. There are some really amazing/beautiful converted chateaux d'eau and a 12th century fortress/dungeon which was later converted to a water tower in 1840! Je regarde par la fenêtre et il pleut aussi beaucoup. La pluie à Paris quand on se balade avec son amoureux sous un grand parapluie, collé côte à côte, c'est si chaleureux. J'aime toutes les saisons. Des rigueurs de l'hiver aux heures chaudes de l'été où l'on porte des sandales, de la pluie, du soleil, la simplicité d'un échange, la sérénité d'un moment, le temps à partager qui est trop court, oui, j'aime ça sous n'importe quel temps à Paris! Slick! What a cool photo. Just when I was thinking you would run out of ideas. Rain is a good thing in California. IN THE NEWS: "California is in its third year of a drought, and many farmers in the state's crop-rich Central Valley are looking at dusty fields, or worse, are cutting down their orchards before the trees die." Carrie, Merci for researching that; it was interesting. "It's Paris, it's raining!!" :) I don't love Paris in the rain but it sure cuts down on the line at la tour Eiffel!! :) Your weather is the anti-Havaianas.